You are in Emporium Shopping online department store, category, department looking for items Fiskars 96685935J LNG Hndl Digging Shovel. 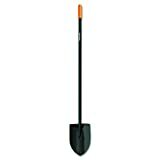 Fiskars Garden IsoCore 5 lb Pick, 36"
The Fiskars long-handle steel digging shovel makes it easy to dig into tough soil without sore knees from kneeling or back strain from bending. The welded steel construction is far more durable than wood and won’t flex like fiberglass. A sharpened blade cuts into dense soil easily, an extra-large foot platform helps maximize force to break up hardened soil clods, and a teardrop-shaped shaft profile provides exceptional comfort and control. Thank you for visiting our store and shopping Fiskars 96685935J LNG Hndl Digging Shovel with us. Come back to buy online.